In a 2014 survey of freshmen students, 82.2 percent felt it was “very important” to learn about topics of interest during their time in college, while 77.1 percent felt it was “very important” to get training for a specific career. As we work to prepare students for careers in the public service, it’s important that we offer students opportunities not only to learn about important topics, but also to engage in policymaking work outside of the traditional classroom setting. At the Wilder School’s Office of Public Policy Outreach (OPPO), we approach student engagement as a way to bridge academic and policymaking settings. We not only want our students to learn more during their time here, but we also want to ensure that they are competitive on the job market and that they have the skills needed to excel in their careers. One way we provide these opportunities is through serving as a host organization for the Wilder Fellowships program. In the program, students receive a stipend in exchange for their work. Fellows take on a variety of assignments with nonprofits, government agencies, businesses and, as is described by Wilder Fellow Aleigh Faulk below, different divisions around the university. In her first month as a Fellow, Faulk worked with OPPO faculty and staff on a variety of tasks, including helping to organize a “mental health mini-university” in September. She also assisted with event planning (e.g. organizing a field trip for homeschool students to learn about the OPPO and planning a policymaking workshop for Girl Scouts) and helping our programs obtain SWaM certification. As Shajuana Isom-Payne, the Wilder School’s Assistant Dean of Student Services, describes, this type of Fellowship yields benefits for both students and the agencies with which they work. We also host students as interns, including persons from other schools within the university, as well as local high school students. In some cases these students create a formal arrangement with a faculty member or department and receive class credit for their work. Others want to gain experience in a less formalized manner may serve as voluntary interns. In these cases, the student chooses what type of work they would like to complete as well as how much time they would like to commit. In all instances, we work to ensure the internship opportunities we provide are shaped to match the unique needs of each students and we ask students to let us know what opportunities are of most interest to them. Examples of such intern driven projects include a graduate student who has helped identify community organizations that may be interested in learning more about the OPPO, and an undergraduate student who is helping staff members develop an “equity and inclusion” curriculum for our Land Use Education Program. As noted, our internships are not limited to university students. Local high school students interested in entering the field of public policy and administration have also worked with us to learn more about potential career options. For example, Kate McCullough, of nearby Maggie Walker High School, is writing policy snapshots this fall using findings from our poll data that are sent out to policymakers, academics, and other interested individuals. 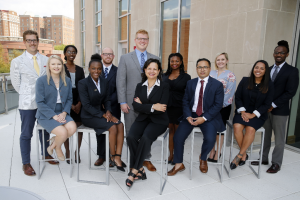 As McCullough and other students move forward with their internships, we will continue to tailor their projects to match their interests and goals. Engagement outside the classroom allows students to develop their skills, gain new opportunities and contribute to their universities and communities. Though creating opportunities for student engagement involves time and resources, universities, faculty and staff, communities and, most importantly, students have much to gain.